With malls, hotels, offices, and leisure areas, Istanbul New Airport will be a city in addition to serving 90 million people after the first phase starts operating. MIPIM 2017, the world's largest and most important real estate fair, to be held from March 14-17 in Cannes, will, for the first time, showcase Istanbul New Airport and Airport City Istanbul, which is expected to become a reference for the future of airport cities. Previously introduced at MAPIC, another international retail real estate show held in Cannes each November, Istanbul New Airport will have an operational capacity of 200 million passengers once fully completed, taking the place of the world's largest airport built from scratch. Speaking to Daily Sabah, Istanbul Grand Airport (IGA) Construction Board member Mehmet Kalyoncu said the airport would be a point of convergence for the business world and social circles. He expressed their excitement to exhibit Airport City Istanbul, located near Istanbul New Airport on an area of almost 10.5 million square meters to local and global investors for the first time at MIPIM 2017. The model of the airport city, which has so far been developed for only a couple of airports in the world, will be Turkey's first ever, Kalyoncu said. The airport city will include areas for hotels, offices, malls, social living areas as well as fairs and event zones that will revive the economy by offering new opportunities for employment, he said. Moreover, drawing attention to the design, as a green and sustainable city, Kalyoncu said that not only airport users but also Istanbul and its residents would benefit from the airport city. In that regard, airport city constitutes an example for similar projects across the world, he added. 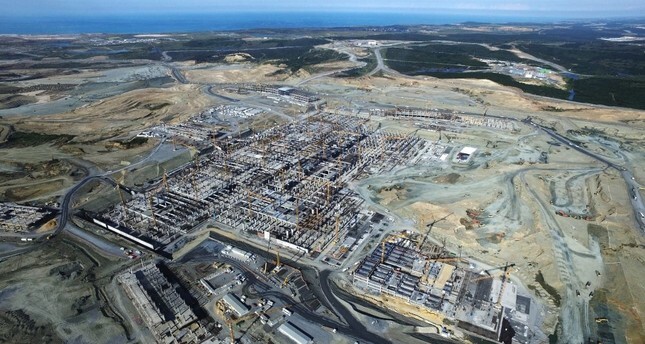 The first stage of construction of Istanbul's new airport is nearly 40 percent complete, marking a significant milestone in the construction of the world's largest airport, scheduled to open in 2018. The estimated cost of the airport projects is around $6.6 billion, exlcuding financing costs. The third airport in Istanbul and the largest in the world, Istanbul New Airport will be able to host 90 million travelers by the end of the first stage of construction and 200 million upon completion, making it the world's largest transportation hub on the largest plot of land ever designated for an airport facility. As previously reported, a new metro line that will connect Istanbul's third airport to the city center and pass through Istanbul's six districts will be built by the Ministry of Transportation, Maritime and Communications. The construction of the 13-station metro line is estimated to cost TL 4.9 billion ($1.31 billion). This year, MIPIM will be organized on an area of 19,000 square meters and is expected to welcome more than 23,000 visitors. In addition, more than 5,300 investors and financial institutions will participate in the world's largest and most prestigious real estate fair, hosting some 150 networking events and 100 conferences. In terms of numbers of participants, Turkey ranks fifth among approximately 90 countries attending MIPIM. A delegation of 850 people in an area of 1,800 square meters will represent Turkey and share details of its potential to fair attendees. The event is expected to facilitate financing for investment projects worth up to $500 billion. It is also expected to host 18 to 20 cities from Turkey. Istanbul, Kocaeli, Antalya, Hatay, and Balıkesir have already guaranteed their places with projects worth millions of dollars. In addition, Beyoğlu Investors Group (BIG), which includes businesspeople that have made investments in Istanbul's Beyoğlu district, will also participate in the fair with 45 investors and six projects. A total of 150 companies, including IGA Airports Construction, BIG, Turkish Ceramics, Association of Mineral Exporters and many other Turkish real estate and architecture companies will represent Turkey at MIPIM. Environment and Urbanization Minister Mehmet Özhaseki will also attend the fair. Turkey's participation at the ministerial level is deemed important, as it will more effectively highlight the potential of the Turkish real estate sector, said Yonca Aközer, general manager of Alkaş, the company coordinating Turkey's participation in the fair.